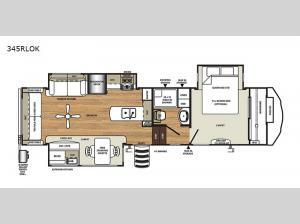 Come see just how easy it is to enjoy camping and entertaining in this triple-slide Sandpiper fifth wheel. In the central living area you will find room for everyone to join you on the hide-a-bed sofa, theater seating, and free-standing table because of the opposing slides, and you will be able to store any perishables in the residential refrigerator and canned goods in the nice-size pantry. 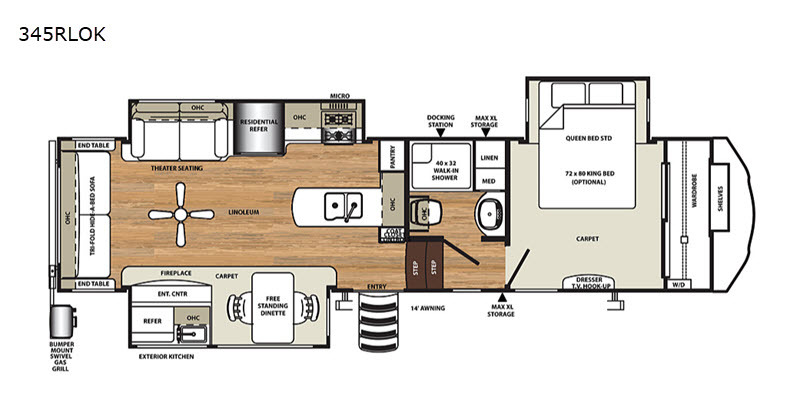 When you want to spend more time outdoors, enjoy the extended living area underneath the 14' electric awning with LED lights which provides plenty of shade, and when it is time for your evening meal, you can prepare it outdoors at the exterior kitchen which has a refrigerator, sink, and bumper-mount swivel gas grill.